Vanguard Total Stock Market ETF (ETF:VXUS) offers investors diversified exposure to non-US companies(indeveloped and emerging markets) and is based on the FTSE Global All Cap ex US Index. 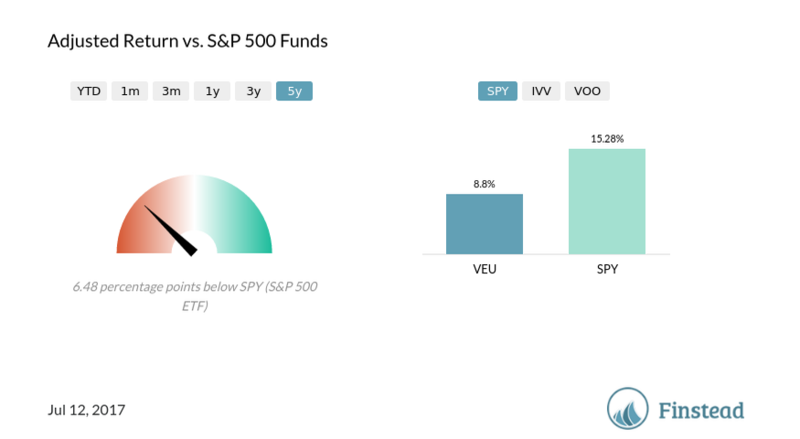 In this review, we’ll take a look at the fund performance (share—not stock—historical price, return, dividends, yield, holdings / composition, cost / expense ratio, tax efficiency and beta), and the alternatives (VXUS vs. VEU, VXUS vs. VEA, VXUS vs. VGTSX, VXUS vs. VTIAX, VXUS vs. SCHF, VXUS vs. VT) available to individual investors. 1. What is Vanguard VXUS ETF? Vanguard VXUS is an ETF that tracks the performance of a benchmark index that measures the investment return of stocks issued by companies located in international markets, outside the US. The index that VXUS tracks is FTSE Global All Cap ex US Index, which is market-cap weighted. The index includes over 6,100 stocks of companies located in over 45 countries. 2. Whom is VXUS appropriate for? Index funds such as VXUS are ideal for individual investors wanting to get a broad exposure to international markets, including both developed and emerging. VXUS is a good fit for long-term investors, for whom money’s growth over a longer period of time is essential. Conversely, it may not always be the right fit for short-term investors. 3. How do you rate / rank VXUS? We don’t assign star ratings, such as Morningstar, but rather guide individual investors to make a decision based on their investment goals, experience and knowledge of the market. If you’re a novice in investing, and you’re looking for a broad exposure to non-US markets, you should give this fund a shot. We give it a triple green. VXUS: 1. Offers diversified exposure to non-US large-, medium- and small-cap stocks, in developed and emerging countries; 2. Has a very low expense ratio, 0.11%; 3. Has historically done well. A low fee and a reasonably representative portfolio make the fund well-positioned to do well in the future. A word of caution—a triple green doesn’t mean you should invest in the fund now. It has to be right for you, given your investment goals. Also, we have no idea what the future will look like for VXUS (or international markets)—and whether international stocks are overvalued at this point. 4. What is the FTSE Global All Cap ex US Index? What should I know about it? It is a market-capitalization weighted index representing the performance of around 6,100 large-, mid- and small-cap companies in 45+ developed and emerging markets worldwide, excluding the USA. The index is used for Vanguard Total International Stock Index Fund (VGTSX), Admiral Shares (VTIAX), and Vanguard Total International Stock ETF (VXUS). 5. Does VXUS give investors exposure to the US market? Many of the fund’s largest holdings are multinational firms, so VXUS has substantial indirect exposure to the US market. The headquarters of VXUS holdings are based outside the US. 6. What are VXUS holdings? Those top 10 assets account for 7.63% of the fund’s performance, which is somewhat concentrated because of the market cap weights. These 10 assets would account for 0.02% of an equal-weight Total All Cap ex US Index fund. 7. How did VXUS perform / how much did VXUS return over the last 3-5 years? VXUS shares (not stock) returned 1.76% per annum over the last 3 years, and 8.78% over the last 5 years. Below is the VXUS price chart. 8. What is VXUS expense ratio? The expense ratio for VXUS is 0.11%, which is fairly low. 9. What is VXUS tax efficiency? What is VXUS tax-cost ratio? The one-year tax-cost ratio (return reduction because of taxes investors pay on distributions) for VXUS is0.87%. That means that because of dividend taxes, returns are effectively reduced by almost one percent. 10. What is VXUS beta? What is VXUS risk profile? The five-year beta (volatility) for VXUS is 0.97, measured against S&P 500. This means VXUS is slightly less volatile than S&P 500. You should expect higher performance of more volatile funds, because they are riskier. The R-Squared for VXUS is 98.24%, which means that VXUS (FTSE Global All Cap ex US) is highly correlated to S&P 500. 11. How much does VXUS pay in dividends? What is the VXUS yield? Based on this, the trailing 12-month dividend amount is $1.38, so the trailing 12-month dividend yield is 2.67%, assuming the VXUS price of $51.72. 12. What are some good international (non-US) ETFs? IXUS iShares Core MSCI Total Intl Stock ETF; its expense ratio is 0.11%. IXUS has over 3,300 holdings. It gives investors exposure to a broad range of international developed and emerging market companies. IEFA iShares Core MSCI EAFE ETF focuses on developed markets outside the US and Canada. The expense ratio is 0.08%. IEFA has over 2,500 holdings. SCHF Schwab International Equity ETF; its expense ratio is 0.06%. SCHF has over 1,300 holdings. It focuses only on developed markets. VXUS Vanguard Total Stock Market ETF; its expense ratio is 0.11%. VXUS focuses on both developed and emerging markets and it has around 6,100 holdings. VEA Vanguard FTSE Developed Markets ETF; its expense ratio is 0.07%. VEA has around 3,800 holdings. VEU Vanguard FTSE All-World ex-US ETF; it focuses on both developed and emerging markets and has 0.11% expense ratio. VEU has 2,500+ holdings. 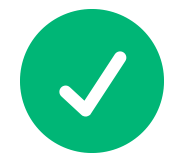 You can trade iShares ETFs commission free on Fidelity, assuming you have a Fidelity account. A short-term trading fee of $4.95 is charged for any sales that occur within 30 days of the original purchase of the ETF. You can trade SCHF on Schwab commission free. 13. VXUS vs. VEU? Should I choose VXUS or VEU? The underlying index is different (although both are FTSE based). VEU is based on the FTSE All World ex US index, while VXUS is based on FSTE All Cap ex US index. VXUS has more small-cap stocks than VEU, because the All Cap index contains small-cap stocks that the All World index doesn’t contain. The All World index (that VEU leverages) has over 2,400 equities in 46 countries. The geo breakout is as follows: 46.3% in Europe, 29.7% in the Pacific, 17.7% in emerging markets, 5.7% in North America and 0.6% in the Middle East. The All Cap index (that VXUS leverages) has over 6,100 equities in 45 countries. The geo breakout is as follows: 45.9% in Europe, 29.6% in the Pacific, 17.5% in emerging markets, 6.4% in North America and 0.6% in the Middle East. Performance wise, they are similar. In the last 5 years, VEU returned 8.8% vs. VXUS 8.78%. Tax efficiency wise, they are similar. VEU tax-cost ratio is 0.86% vs. VXUS 0.87%. VEU and VXUS expense ratios are exactly the same, 0.11%. The choice is really up to you—VXUS gives you a broader exposure than VEU, and it has a lot more securities than VEU. 14. VXUS vs. VEA? Should I choose VXUS or VEA? VEA tracks FTSE Developed All Cap ex US Index. That means it’s focused on developed countries, and individual companies in the fund are market-cap weighted. VEA has approximately 3,700 common stocks of large-, mid-, and small-cap companies located in the major markets of Europe, Asia-Pacific and Canada. VEA has a lower expense ratio than VXUS: 0.07%. VEA also has a Beta of 0.91, which means it’s 9% less volatile than S&P 500. 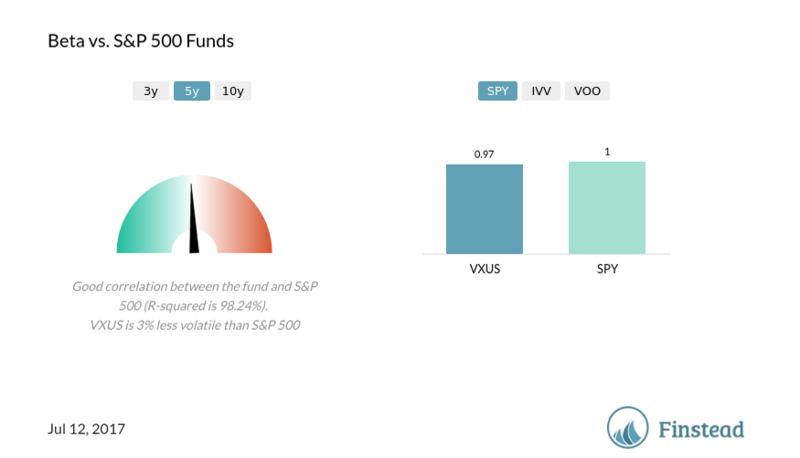 VXUS is also less volatile than S&P 500 (its Beta is 0.94). Performance wise, VXUS and VEA are similar. In the last 5 years, both returned 8.78%. The choice is really up to you—VXUS gives you a broader exposure than VEA, since it includes both developed and emerging markets. 15. VXUS vs. VGTSX? Should I choose VXUS or VGTSX? VGTSX is a mutual fund tracking the FTSE All Cap ex US Index. VXUS is an ETF. VGTSX has a minimum investment requirement of $3,000. VGTSX is more expensive; its expense ratio is 0.18% vs. 0.11% for VXUS. VGTSX is slightly more tax-effective than VXUS. VGTSX tax-cost ratio is 0.84%. VXUS cost ratio is 0.87%. VXUS does not have a minimum balance requirement. Since VXUS is an ETF, you may have to pay a trading commission if you invest outside of Vanguard or zero-dollar brokerages (e.g., Robinhood). VGTSX offers you an opportunity to engage in automatic investments, so you can acquire shares in desirable proportions. In fact, you can even choose an option to automatically deduct from your bank account every month. VXUS, on the other hand, trades similar to stocks. Investors have the option of manual additions to their existing investments. But, the particular amount of shares is usually based on the current share price. With VGTSX, investors are able to automatically re-invest dividends and capital gains, while ETFs often don’t have such a plan. But, if you invest in VXUS on Vanguard, you will be able to automatically reinvest dividends and capital gains. Our recommendation—invest in VXUS (vs. VGTSX) using a low-cost/no-cost brokerage (such as Robinhood or Vanguard for Vanguard funds). 16. VXUS vs. VTIAX? Should I choose VXUS or VTIAX? VTIAX is an Admiral Shares version of the mutual fund tracking the FSTE All Cap ex US index. It has the minimum investment requirement of $10,000. VXUS and VTIAX have the same expense ratio: 0.04%. The tax efficiency for VXUSand VTIAX is very similar (around 0.87%). That means on average, your post-tax return is lower by 0.87% compared to the pre-tax return. VTIAX might be more convenient for automatic investments and dividend / capital gain re-investments, because it’s a mutual fund. Our recommendation—it’s a toss (and it depends on the brokerage you use and your dividend re-investment goals). 17. VXUS vs. SCHF? Should I choose VXUS or SCHF? SCHF tracks FTSE Developed ex-U.S. Index, in contrast to VXUS which includes both developed and emerging markets. SCHF covers ~1,300 securities, which significantly below the number for VXUS (6,100+). SCHF expense ratio is slightly below VXUS expense ratio: 0.06% vs. 0.11%. 0.22 percentage points higher on average for VXUS vs. SCHF. The historical returns of the two ETFs are comparable, although SCHF did slightly better over the last 5 years (9.52% for SCHF vs. 8.78% for VXUS). The biggest question is in deciding between VXUS and SCHF is, what exposure do you seek to have—developed non-US markets, or both developed and emerging? If the former, then SCHF may be the right fit. If the latter, VXUS should be your choice. 18. VXUS vs. VT? Should I choose VXUS or VT? VT invests in both foreign and US stocks. It seeks to track the performance of the FTSE Global All Cap Index, which covers both well-established and still-developing markets. The number of stocks in the VT fund is ~7,800 vs. 6,100 for VXUS. VT and VXUS have the same expense ratio: 0.11%. Both VT and VXUS don’t have a minimum investment requirement. VT historical returns are higher than those for VXUS, because in the past, the return on US stocks has exceeded those for international. VT is more tax-efficient than VXUS. VT tax-cost ratio is 0.66%. VXUS tax-cost ratio is 0.87%. That means the post-tax return will be 0.22 percentage points higher on average for VT compared to VXUS. VXUS is a much larger fund, with over $500 Billion in assets. VT has around $12 Billion in assets under management. VXUS may have higher liquidity than VT, but we think VT is fairly liquid as well. Both funds are good choices. The choice should depend on your focus… if you’d like exposure to the global market, including the US, go with VT. Otherwise focus on VXUS. 19. What is VXUS turnover? And does the turnover really matter? VXUS annual turnover is 3%, which is pretty low. Lower turnover equates to lower costs and smaller taxable capital gains distributions, so it is important. 20. How can I find out the funds that have done better than VXUS? You can get some suggestions on what ETFs have outperformed VXUS through Finstead’s Idea tool. The tool pops out a couple of ETF suggestions (from both the same fund category and overall) that have historically had a higher expense adjusted return and lower volatility (i.e., risk). 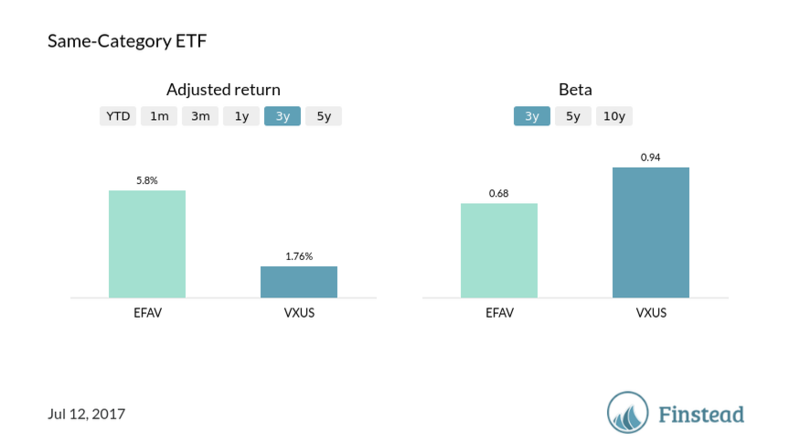 For VXUS, the Finstead idea tool suggests iShares Global Tech ETF (IXN) and iShares Edge MSCI Min-Vol AEFE (EFAV) as an overall fund and the same category fund (respectively) that have had a higher return and lower volatility over the last 5 years. IXN is a global tech fund, and as you know, tech has done incredibly well over the last 5+ years. IXN also turns out to be less risky than S&P 500. But the critics would say that tech stocks are overvalued at this point. 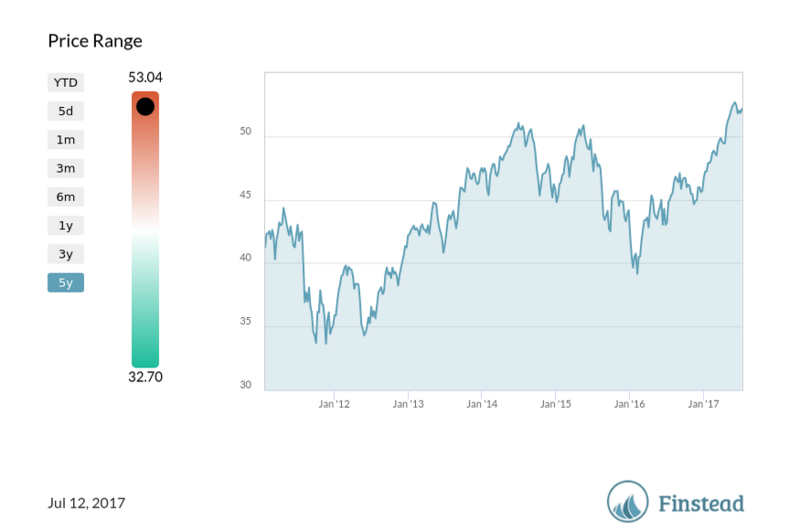 EFAV iShares Edge MSCI Min-Vol AEFE tracks a stock market index that is designed to measure the equity market performance of developed markets outside of the US & Canada. EAFE stands for Europe, Australasia and Far East, and Min-Vol stands for minimum volatility (meaning lower beta and lower risk). But be careful—do your diligence before investing in those funds. What other questions are on your mind? Send us your thoughts to: hi [at] finstead [dot] com.